Mike Dirnt wants to make a difference. When Oakland’s Historic Fox Theater reopened several years ago, following a forty-plus year hiatus, it sparked a renaissance in Oakland’s Uptown neighborhood. The area quickly filled with new bars, restaurants and its nightlife came to life. “Welcome to the Can’t Fail Café, otherwise known as Rudy’s,” says co-owner Mike Dirnt -– one-third of the legendary Oakland band, Green Day. “We’ve had really great parties where we take our collection of odds and ends and toys -- and strange stuff, and we put them together,” says Dirnt showing off the dining tables that populate the generous space. Each table is filled with a collection of oddities, all sealed in resin. Dirnt explains the group of owners hosted table-making parties, which resulted in the eclectic décor. His favorite is a table filled with rusty scissors and razor blades. His wife’s collection, he explains. It’s another funky detail in a room that includes a fabricated airline diner serving as a special event room. Rudy’s Can’t Fail Café -- named for a Clash song -- is the second restaurant for Dirnt and his partners. The first Rudy’s opened nine years ago in Emeryville and is still going strong. Dirnt who was born in Oakland, and like the rest of Green Day still lives here, says he wanted a place where he could share a late night beer and some fries with friends. 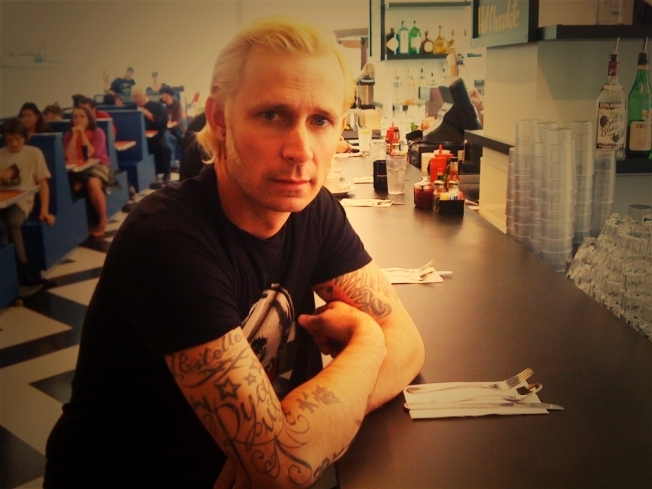 Dirnt lamented the closing of restaurants like San Francisco’s legendary Hamburger Mary’s, where he and band mates would turn-up after gigs. But Rudy’s is more than the story of its celebrity co-owner. It’s the tale of a group of pals who pooled their skills and rolled the dice on Oakland’s progress. Tucked into a corner of the historic Fox Theater in Oakland, the owners are hoping to be part of the neighborhood’s revival. Dirnt, who’s often on the road with Green Day, says he’s happy to play a part in the hometown revival.